Aaarrgh! Whether you’re a long time resident or new to the Tampa Bay area you’ve probably heard about the famous Gasparilla Parade. 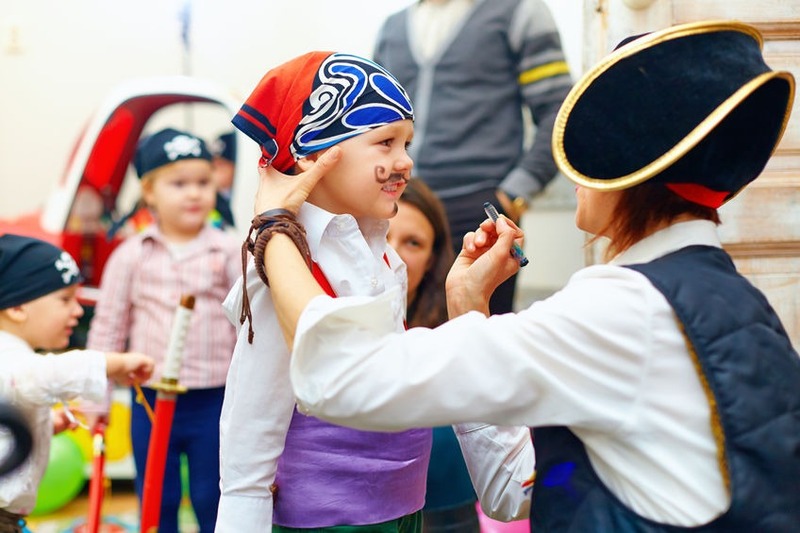 For a family-friendly and alcohol-free kick off to the Gasparilla Season, bring your family to the 2019 Children’s Gasparilla Parade which has been a part of Tampa’s Gasparilla celebration since 1947. The 2019 Children’s Parade kicks off on Saturday, January 19th and festivities run from 11am to 7:30 p.m. When it comes to children, it’s always important to be prepared when planning family outings. 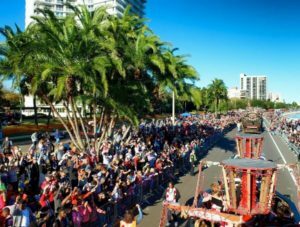 We have a great list of helpful tips for parents as they venture out to the Children’s Gasparilla Parade. 11:00AM Activities open along Bayshore Blvd at 11AM. 1) Stroll will start at 1:30pm on January 19, 2019. 3) Howard Bleacher seating will have a view of the stroll. 2) Parade will begin at Bay to Bay Blvd. & Bayshore Blvd., proceed north along Bayshore, and parade ends at Edison Ave.
1. Arrive Early. The early bird gets the beads, good viewing spot and parking. Some people arrive as early as 9 a.m. to see the parade that starts at 3:30 p.m. Whatever time you do plan on arriving, allow yourself at least an hour or two to find parking and to walk to the parade route and find a good viewing spot. 2. Stake a spot near the beginning or middle of the parade to increase your child’s bead count. 3. Dress Up. Whether its a fun pirate attire or simply a t-shirt or an eye patch, get in the spirit. Everything is always more fun when you dress up. You can purchase officially licensed Gasparilla Treasures merchandise at www.GasparillaTreasures.com. 4. Bring cash. Visit your local bank and get some cash before you head out to the parade. This will make things faster and easier when paying for parking or buying items from vendors. 5. Parking and road closures.There are several options for parking and they will quickly fill up. Local churches and businesses may offer paid parking near the parade route. Parking can be found at the Tampa Convention Center Garage, Ft. Brooke Garage, Poe Garage, Twiggs St. Garage and several others. Please visit the City of Tampa’s list of parking options and road closures. 6. Hop on a trolley. For 2019 the Clearwater’s Jolley Trolley to provide six trolleys to pick up and drop off parade-goers, from the intersections of both Platt Street and Bayshore Boulevard, as well as Rome Avenue and Bayshore. HART will also be offering extra streetcar, bus, and trolley services. 7. Lunch Station. Bring a small to medium cooler filled with lunch, snacks, and water bottles. The parade is long and depending on where you’re located you may not be able to reach a food vendor. So come prepared with enough snacks to last you a couple hours. 8. More Snacks. When you finally think you have brought enough snacks, simply add a few more. You’ll thank us later. 9. Comfortable Footwear. You may have to walk and walk and walk! 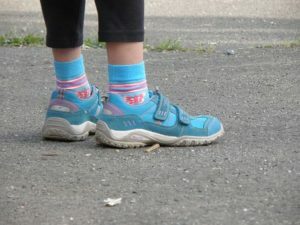 Wear comfortable footwear that you’ll be glad to wear for five hours or longer. 10. Plan for the cold. Bring extra blankets, jackets or sweaters for the children, just in case it gets a little chilly. 11. Plan for the rain. Visit your local dollar store and buy some plastic rain coats in case it rains while you’re on the parade route. An umbrella may be too bulky to carry and with close quarters it may make it impossible to open. 12. Stay protected. Help protect your skin and your eyes. Pack sunscreen for your family and even some pair of sunglasses and/or hat. A pair of sunglasses will make it easier to catch those beads without the sun in your eyes. 13. Get comfortable. Bring a blanket and lawn chairs to claim your parade viewing spot. 14. Backpacks for everyone. Those small backpacks that you get for free at vendor events come in handy at the parade. Have your child wear a small backpack to carry their loot or their snacks. 15. Entertainment. Depending on when you arrive to the parade you may need to find some ways to keep your kids entertained. Bring a ball, plastic swords, games, playing cards, coloring book, etc. There will be vendors throughout the parade route that may offer some fun activities. 16. Backup Charger. If your phone is anything like ours, it loses charge very quickly. Invest in a portable charger to help boost your battery life. You can find affordable options at your local department store. 17. Restroom Needs. Have everyone use the restroom before you hit the parade route. Bring wipes and even a small roll of toilet paper in case the port-a-potties run out of paper. 18. Tag you’re it. While you hope it never happens, plan to have some type of identification on your children. Maybe a paper or tag with your contact information just in case your child gets lost. 19. Take a photo of your child on the day of the parade just in case they become lost. This will make it easier for the police to find them. Make sure to share the photo with your family and friends around you, just in case your phone battery dies. 20. Write your cell number on their arm with a marker or eye liner. Don’t worry, it will come off. 21. If your children have pockets in their clothing, add a card with your contact information on there. 22. Have a meeting spot with your family if you get lost during the parade. Whether it be at a local restaurant or monument, make a plan. 23. Keep your pets at home, unless they are service animals. 24. Krewes can only give beads after the start of the parade which is at Bay to Bay. So avoid trying to get beads before the actual parade route. 25. Bring a Stroller, wagon or beach cart to carry all of your families belongings. 26. Glow necklaces to help keep track of your family when it gets dark. There will be some dazzling fireworks following the parade at 7 p.m. You can purchase glow necklaces at the dollar store. 27. Bringing Water Bottles? Try freezing your water bottles and let them thaw out while you’re at the parade. This will help quench your thirst when you’re looking for something cold to drink. 28. Clean those hands. Bring a bottle of hand sanitizers or wipes to clean off your hands after using those port-a-potties or to clean up any spills. 29. Use Uber, Lyft or any number of car riding services if you really want to avoid having to bring your car. Be prepared to walk as road closures are plenty. 30. Reserved Seating may be an option if you’re willing to pay for it. Visit gasparillatreasures.com for more information. 31. Buy your own loot. Want to guarantee that your kids get some beads? Head to the dollar store and purchase some beads to place in your bag so if for some reason one of your kids are sad because they didnt get enough beads, then you’ll be the champion for bringing extra. 32. Make Signs. If you know of a Krewe that will be in the parade, write their name on your sign and you may get some extra beads from them. 33. Bring a carrier if you have little ones. When kids start to get tired, you may want to use a carrier to keep them close by and up where the action is. 34. Bring a mini first aid kit. Hope for the best and plan for the worst. Bring a basic kit with band aids just in case your kids fall and scrape their knee on the pavement. 35. Come have fun. It’s going to be a lot of people, it may be slightly stressful. Some parents may get pushy for beads. Overall its a fun experience for the kids. Enjoy!